2019 is a pivotal year for the insurance industry. As change, innovation and tech are driving us forward at pace, the unique and pioneering work of the leaders, teams and companies across the insurance industry deserves to be recognized. 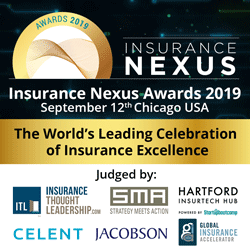 The Insurance Nexus Awards 2019 celebrate those demonstrating excellence to meet customer and community needs, with 15 categories across innovation, claims, transformation, products, service and more. An esteemed panel of judges will rank nominations to decide the winners, who will be revealed at an exclusive ceremony in Chicago, September 12th to fully celebrate the incredible work happening across insurance.